Unless you spent the last weeks in a cave, you probably heard of the recent phenomenon called Pokémon GO so this Pokemon Calculator should come handy. New augmented reality game from Niantic Inc. quickly attracted millions of players around the world and became the most popular topic in many conversations. While we're still trying to find Charizard in our area, we developed this Pokemon calculator to help you figure out how much weight you can lose while playing the game. How does this Pokemon calculator work? The game itself requires a lot of walking and while exploring the area, you'll probably come across mysterious eggs (are they PokeEggs?). They're especially common in so-called PokéStops spread around the map so make sure you stop by and reap your rewards. Each egg you find will come with specific requirement of distance you have to cover to get your eggs to hatch. Creators of the game came up with 3 possible options - 2, 5 and 10 kilometers (1.24, 3.1 & 6.21 miles, respectively). Once you reach the required distance use your Egg Incubator and wait for a bit till your new Pokémon shows up. And it's now ready to join your impressive portfolio! We used ShapeSense's article to grab the formulas for calories burned while walking (to make the tool simple we assumed the terrain is flat, if you're hiking up you're clearly burning even more). What matters is how much you weigh, how fast you walk and how much time you do it for. For the purpose of calculating the amount of fat burnt, we use common formula of 7700 calories burnt = 1kg of body fat burnt. Please note that results returned by this Pokemon Calculator are approximate and can depend also on other factors. 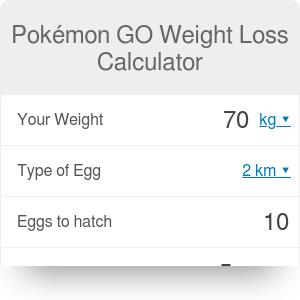 Pokémon GO Weight Loss Calculator can be embedded on your website to enrich the content you wrote and make it easier for your visitors to understand your message.